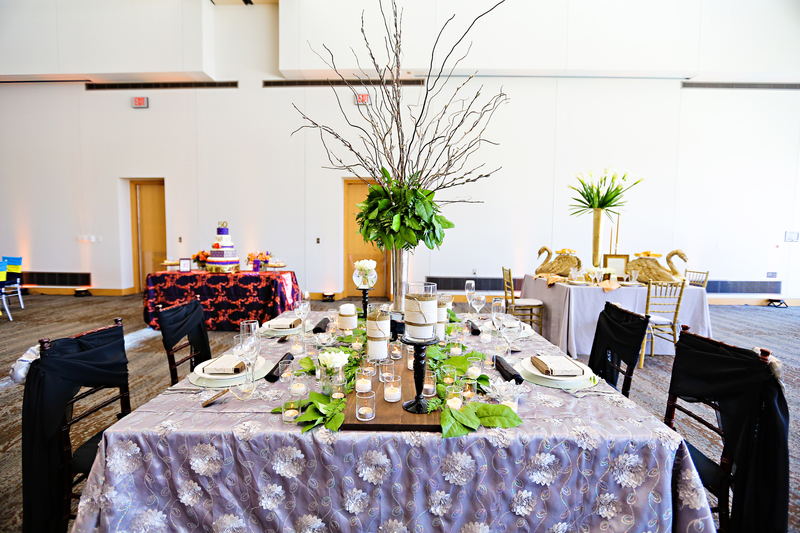 We are excited to share our table photos for Art of the Table 2012. This year’s event was great as always. As a committee member we were excited to see 29 table designs, the most we have ever had. All of the designers went over the top a pulled off amazing designs. The great thing about this event is that it caters to everyone. 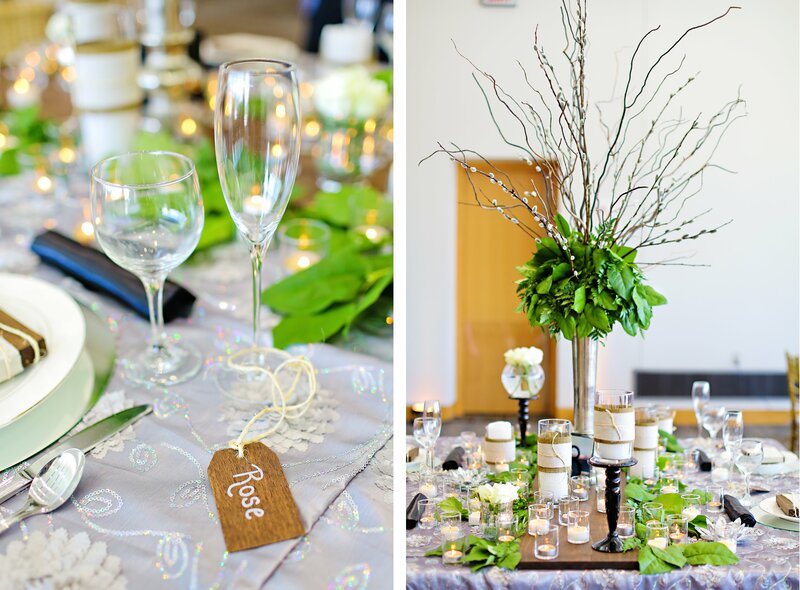 Whether you are planning a romantic, contemporary or beach wedding, you could see a design in your style. Even if you were not planning a wedding, we had a design for you too. Please enjoy our two tables, we had a blast creating them! This was our romantic wedding table. 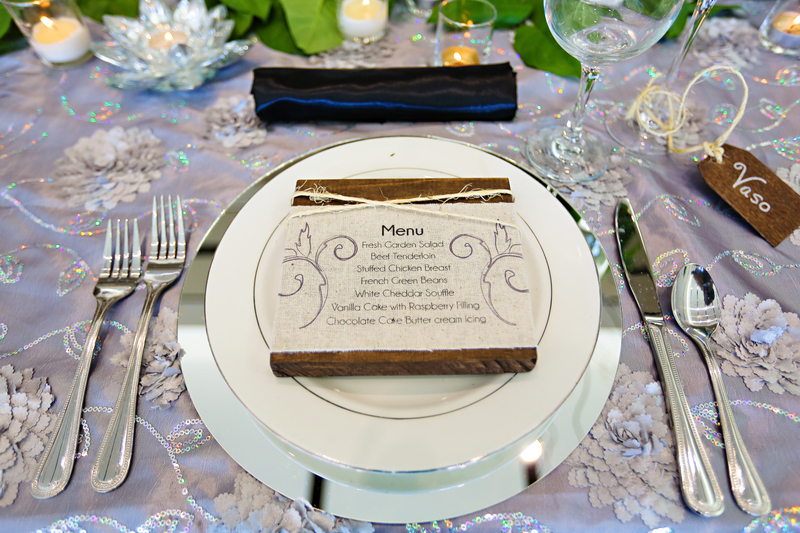 We fell in LOVE with these linens from Wildflower and had to design a table around them. The idea for the centerpiece was a garden that has gone a bit wild and is overgrown. The best part about Lilly Lane’s design (besides the roses of course!) was that as you moved around the table you were greeted with a different look. It made the table interesting and fun to look around, you never knew what was around the corner. Our second table we went a little wild and did a social table. This is a little girl’s birthday party themed as Alice and Wonderland’s Mad Hatter Tea Party. This is a fun theme to work with because anything goes. The Mad Hatter Tea Party was a crazy UnBirthday Party with tons of teapots and cups. We use this idea and expanded it to include giant teacups for our topsy-turvy cake and flower display. We picked the top linen because of its fun color changing feature. The bubbles are one long linen that changes colors depending on what is below it. How fun! Can you imagine being a little girl and having your very own grown up tea party? I cannot wait until I can use these for a real party. Check out the entire event photos at the Art of the Table website. Hope you enjoyed our photos, we enjoyed designing them. 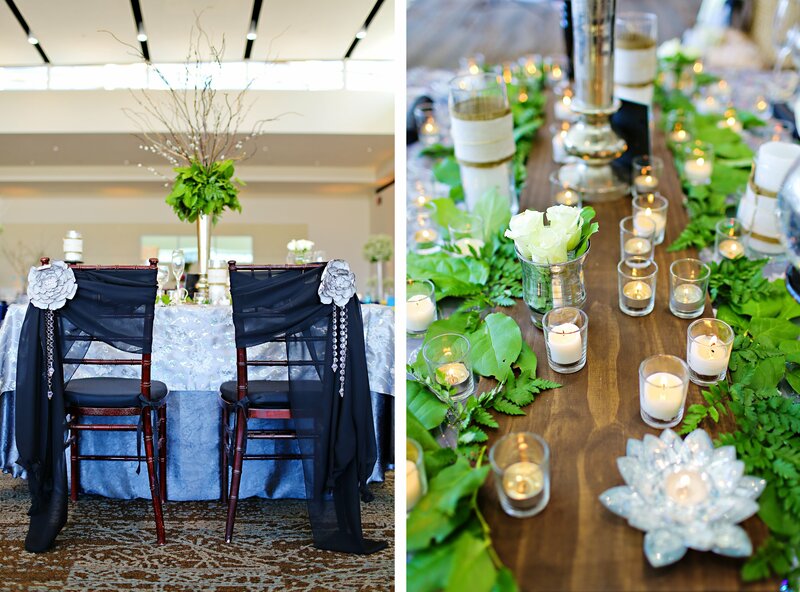 What is your favorite party of our table designs? Below is my design board I made for inspiration for Art of the Table. I am working with Tanya from Heavenly Sweets and since I am a visual person I made this board so Tanya could see my thoughts. This year each table is a season, gem or stone and event. We have chosen silver, winter, and Christmas. As you will see below, we are not doing a “traditional” Christmas table. You will not be seeing a red and green table. 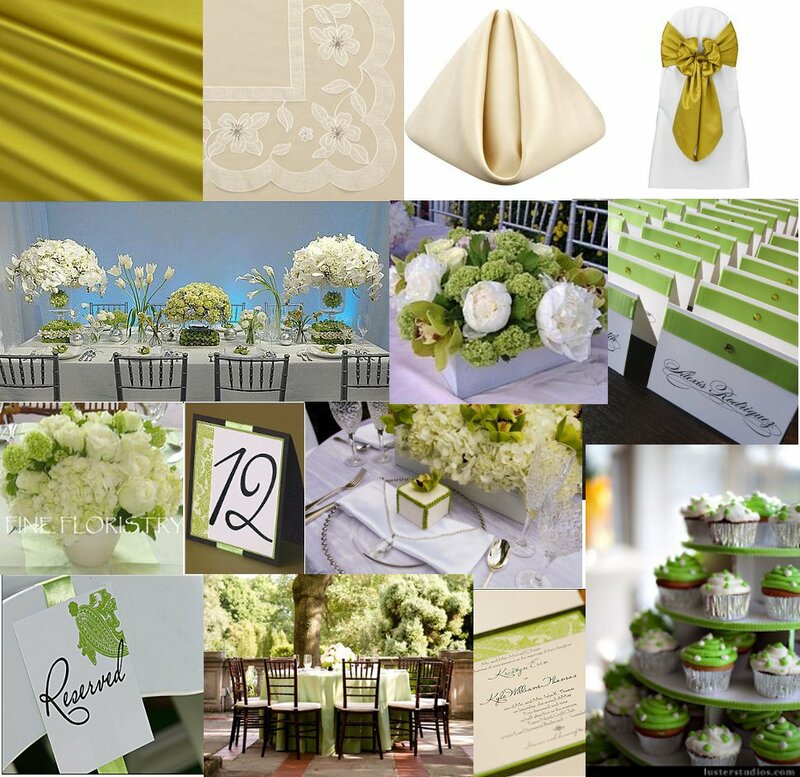 Instead, you will be seeing a citron green, ivory and white design. We invite you to come and view our table and enjoy some of Heavenly Sweets’ cupcakes. Art of the Table is this Sunday March 6th at The Columbia Club on the circle from 12-4pm. Tickets are just $10 from me or $12 at the door. This event benefits many charities including the American Cancer Society, HELP Food Pantry, Wish Upon a Wedding and the Miss Dorothy Scholarship Fund. This is a great design event that you do not want to miss. Come see how our design board translated to our table. I am excited to be apart of Art of the Table 2011. This event is sponsored by the Association of Bridal Consultants (I am a proud member) and benefits several charities. It features about 25 beautifully designed table scapes by designers from Indianapolis and the surrounding areas. This year we are The Columbia Club and is on March 6th 12-4pm. Tickets are just $10 a person and not only will you get to see great design, but you will also get a little food too. I am excited this year to be able to help with one of the tables. 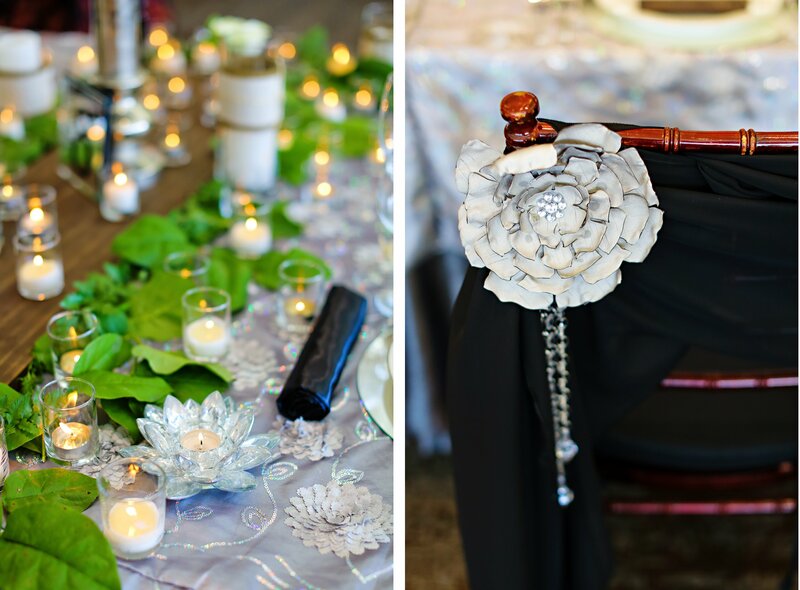 I have teamed with Tanya from Heavenly Sweets to create a beautiful table. The best part is that she is supplying cupcakes on the table for everyone to eat. If you have never had a Heavenly Sweets cupcake, then you have to come. This is an event you do not want to miss. It is a double bonus, you get to see great design and donate to charity at the same time. Are you go to be there?